Here is a Windows 8 tutorial on how to skip the tile interface and boot directly to desktop. The Tile Interface in Windows 8 is a love it or hate it affair. If you are on the hate it side of things, then article will be helpful for you. Whenever you boot into the Windows 8, it takes you into the Title Start screen directly and then you are supposed to click on the Desktop tile every time you log into your account, this can be a little frustrating for some of us. So, here is a little trick that will help you avoid the Tile interface. This does not remove the tile interface from Windows 8. Check out other Windows 8 Tutorials. First thing you need to do is start the Notepad application, to do so just start typing notepad on the start screen and it will come up as shown in the screens shot. Now, save the file that copied the above code into it, now save the file with a .scf file extension. Name it what ever you want to, we are going to use ShowDesktopNow.scf. After you have saved the file, you can just exit the notepad window, but remember where you saved it. The files location is supposed to be used in the further in this tutorial. 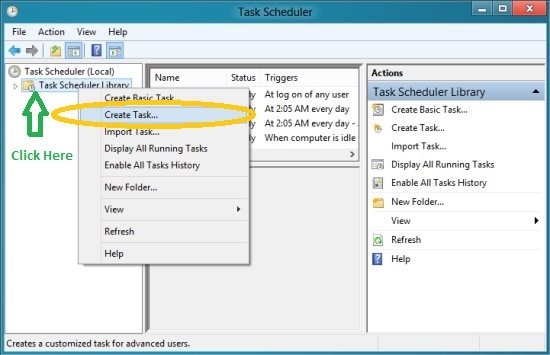 Open up Control Panel and navigate to Administrative Tools –> Task Scheduler. 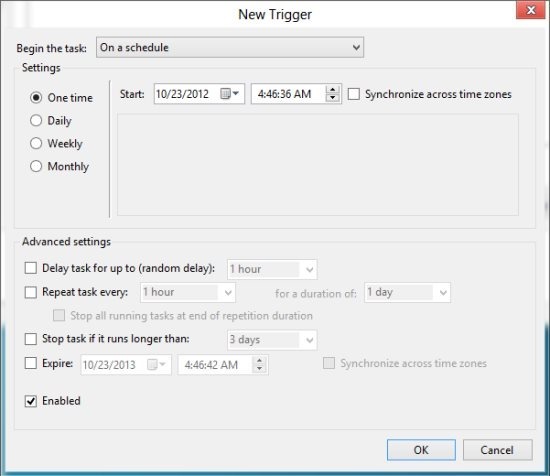 Now, when you click on the Task Scheduler, a window will open up. Now, just click on the Task Scheduler Library which is located on the left corner of the window, as seen in the window below. The click here pointer in green shows where the Task Scheduler Library, now right-click on it, a menu will come up as seen below and now you are supposed to click on the Create Task as highlighted by orange. After you have clicked on Create Task a window as seen below will open up. Now, name this task what ever up want to. I have used the name of this task Show Desktop Now. Now that you are done with the naming, just click on the Trigger tab and click on a New button on the lower left corner of the window to bring up the window as show below. Then, change the Begin The Task to At Log on and click on ‘Ok’ button. Click on the Actions tab, and in a similar manner as above click on the New button, this will bring up a window as shown below. 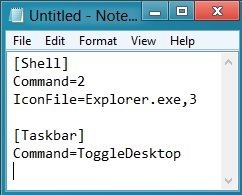 Here, you are supposed to add the Notepad file that you created. 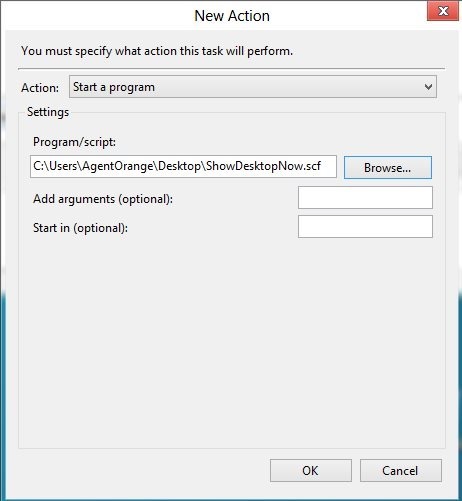 This is all you are required to do here and click on OK.
Now, click on the tab called Conditions and uncheck the “Start the task if the Computer is on AC power”. Now, click on ‘ok’ and you are done. From now onwards, you will be taken into Desktop mode every time you start your computer or log in. The one last thing that I would like to point out is that when the Desktop mode will open up it by the Task Scheduler, it will automatically open up the Windows Explorer. you will have to close it manually. Anyway, it’s better than seen the title interface every time you log in. I think Microsoft should integrate this kind of setting in Window 8 if it wants to see large-scale adoption rates. Go ahead and do it yourself.